Over the years studying herbalism I have built up an extensive library on the subject. The books shown below are the ones I have found most useful on various aspects of herbalism and health. Where they are still in print, I include links to Amazon.com and Amazon UK. For those which are out of print, Alibris and AbeBooks are good sources for second-hand copies. This is a lovely book. A page is devoted to each herb and excellent photographs are used to illustrate the parts used. 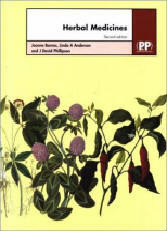 Clear information is given on the use of the herbs and Chevallier also provides a practical guide to making herbal remedies. Duke concentrates on using herbs to treat a wide range of health problems. He gives an honest appraisal of the value of around six herbs per ailment. His style is entertaining and he provides a good deal advice based on his own experience. 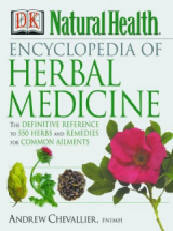 This book considers herbs mainly from a pharmaceutical view point. It provides detailed information of regarding recent research and clinical studies. Side-effects and contra-indications are professionally outlined for each herb. This is an excellent book for those wishing to go into greater depth. Mills conveys in depth information in a simple, understandable way. He provides a comprehensive coverage of medical herbalism, including physiology and the origins of disease, the traditional view of pathology in which herbal therapeutics have their origins, chemical composition of medical herbs and good coverage of herbs that may be used for specific illnesses.